Use a Repeater field to add a group of fields any number of times. This field allows users to click an 'Add' button to add another group of fields. This field is incredibly useful if you would like users to add details about multiple items in a form. This feature is commonly used when adding information for multiple individuals, such as children, in a form. If you would like your section to be collapsible, you can check this option. To learn more about collapsible sections, click here. With the Repeater, you can choose the layout you would like for the fields within that section. To set the layout, go into the Section Heading field and select the Repeat Layout that you would like. The Inline format will display all the fields in the Repeater on one row. The Grid format will display all the fields in the Repeater on one row with the field names only on the top of the first row. By default, the repeat buttons will show a (+)(-) symbol as well as the Add/Remove text. The text can be changed to whatever you would like, or you can remove the text altogether and only have the (+)(-) symbols. Alternatively, the (+)(-) symbols can be removed so you only see text on the Add/Remove buttons. Click on the (-)Remove (+)Add field inside of your Repeater Section. Set your Add New Label and Remove Label text. Choose if you would like to have 'Icons', 'Text links', or 'Text links with icons' for the Repeat Links option. 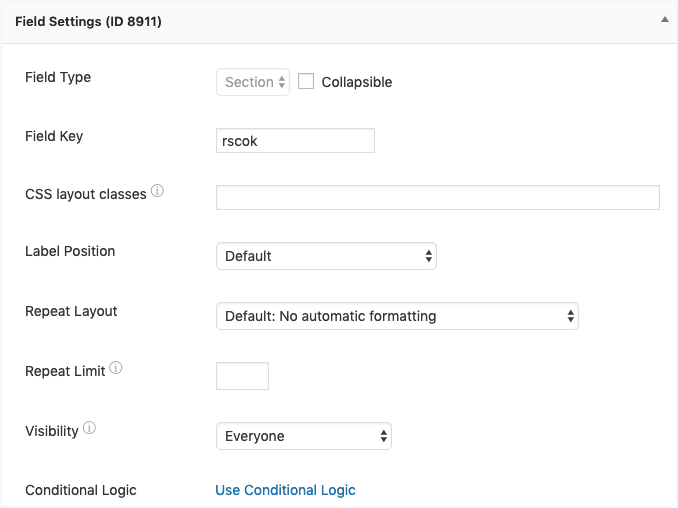 With the Repeat limit, you can set the maximum number of rows a user can add in a Repeater field. If no value is set, it will allow users to submit as many rows as they want. It needs to have a value of at least 2 to trigger this function. Add a Repeater field by clicking on Repeater in the Fields Panel (in the right sidebar). Drag and drop the field(s) that you would like into the Section. Now you can customize the layout of the repeat rows or change the repeat buttons. To customize the default styling for Repeater fields, go to Formidable → Styles → Section Fields and click the 'Repeatable' tab. Select the icons that you would like to use for your add/remove buttons. The values in the field in the Repeater will be added together automatically. If the values in the Repeater are words instead of numbers, you can check the text calculations checkbox, too. The total field will contain a comma-separated list of the values in the field in the Repeater. You may use the [foreach] shortcode in a View or an email to group values from a Repeater by row. Alternatively, you may create a View from a Repeater field. A View from a Repeater provides ordering and filtering options that the [foreach] shortcode, in a View from the main form, does not. A View from a Repeater could be standalone or could be nested inside of a View from the main form. Replace 100 with the field ID of your Repeater field. Replace 101, 102, and 103 with the field IDs that are inside of the Repeater. Replace 100 with the field ID of the Repeater field. Replace 101, 102, and 103 with the field IDs that are inside of the Repeater. If you would like to learn how to create a View directly from your Repeater field, click here. Other field types are much simpler to display in an HTML field on the last page of your form. But repeater fields need a bit of extra code. Use [frm-repeat-post section_id=25 field_ids='26,27'] in the HTML field at the end of your form. Replace 25 with the ID of your repeater field, and 26,27 with the fields inside of it.